The Friedsam Memorial Library is often considered to be the most beautiful building on campus. Built in 1938, it replaced the library in Alumni Hall after its fifty years in service. St. Bonaventure's collection had grown too large for the cozy library in Alumni Hall so it was determined a larger library was needed. Designed by architect Chester Oakley, who also designed Devereux Hall and Hickey Memorial Dining Hall, the Friedsam Library is a building rich in symbolic detail and home of the world renowned Franciscan Institute. Friedsam was made possible by an unlikely benefactor, Colonel Michael Friedsam. Col. Michael Friedsam was born in New York City on February 10, 1858. He attended the New York Public Schools and Weston Military Academy in Weston, CT. In 1913, Col. Friedsam became president of the B. Altman Co., a position that he kept until his death. Col. Friedsam was reported to be a humanitarian and to be very influential in the civic affairs of the City. During World War I, he served as Quartermaster General of the New York State Guard, from which he retired with the rank of colonel. Friedsam died on April 6, 1931 (Dedication Booklet). Besides a few other financial matters, he had the majority of his fortune set aside to form a foundation that donated money to institutions that promoted the betterment of youth and the human condition. St. Bonaventure was deemed to be such an institution. 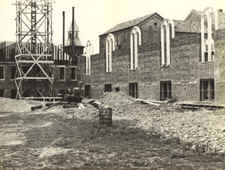 Groundbreaking on May 21, 1937. Friedsam under construction August 15, 1937. 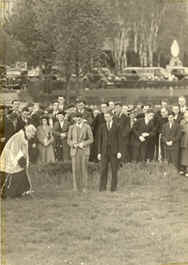 The groundbreaking ceremony for the new library took place on May 21, 1937. In less than a year, the library would be completed. Before Friedsam could open, however, 40,000 volumes needed to moved from Alumni Hall to Friedsam. Using a method a method called a "Bucket Brigade," the students and seminarians stood in two lines with a librarian at each end, forming a human chain. Every book was passed hand to hand, transferring books from Alumni Hall to their proper position in Friedsam. The transfer took eight hours, with students alternating in two hour shifts. The "Bucket Brigade" was so efficient that library service was able to continue the next day ("Old Fashioned Bucket Brigade"). The "Bucket Brigade" moves the collection on Feb. 17, 1938. Alumni Hall is in the background. 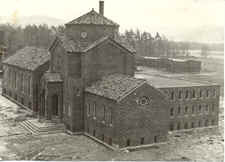 Friedsam Library was dedicated on March 7, 1938 by Msgr. John J. Nash. The new building could have been considered a Chester Oakley masterpiece. Great detail and attention was given to every part of the building from the exterior ornamentation to the ceiling of the reading room. The dedication of Friedsam Library, March 7, 1938. The newly completed library, 1938. The original building of Friedsam Library was two hundred by thirty-eight feet end to end (Beardsley). The exterior focal point is the sixty foot octagonal tower. Rose windows encircling the tower repeat the octagonal design. The building is designed in the Italian Transitional style. The exterior is made of Harvard Brick and the roof of red Spanish tile. Placed on the twenty foot portico is a terra cotta icon of Our Lady of Perpetual Help. The icon, originally designed for a church, was donated by Corning Glass (Beardsley and Herscher). It was placed on the portico at Chester Oakley's suggestion. The sixty foot octagonal tower. 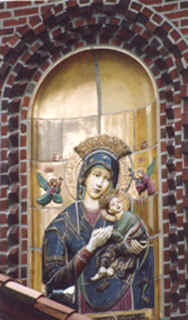 Terra cotta icon of Our Lady of Perpetual Help. Other terra cotta ornamentation can be found on lintels and on the windowsills. The front columns are topped by angels holding scrolls inscribed with the words, "Novo et Vetera," meaning, "New Things and Old." The library's front entrance. Notice the angels on either side of the entrance way. The terra cotta angels hold scrolls with the inscription, "Novo et Vetera"- "New Things and Old." In the lobby area of the library's interior, faience tiles are arranged on the floor in a starburst pattern (Beardsley). The wood work, including the door moldings and balcony banisters, is all American Black Walnut. The built-in circulation desk is designed with inlaid diamond-shaped panels. On either side of the desk are built-in display cases. Hanging from the ceiling directly above the starburst on the floor is a gilded, hand-carved, octagonal chandelier. The stacks used to be able to be accessed from directly behind the circulation desk. A wall has since been put up where the open space existed and portrait of Col. Friedsam hangs above the desk. The circulation desk circa 1940s. Flanking the front desk are a pair of spiral stair cases that go up to the second floor and down to the ground floor. Directly to the right of the lobby is a Video Conferencing Center. Established, along with a Digital Media Center, in January 2003 with a $25,000 grant from the Verizon Foundation, this Center permits two-way audio and video meetings and has the capability to produce live Web-based streaming and recording. Prior to this change it was a lounge area that was also known as the copy room. Originally the space was the Father Pamphilo Memorial Room, named for the first University president. The room was enclosed by Walnut doors and an iron gate ("Friedsam Library"). An interesting characteristic of the area is an arched niche with book cases at the either side. These book cases are from the reading room of the former library in Alumni Hall. The library reading room circa 1940s. To the left of the lobby is the main reading room. The room is one hundred feet long with large, Roman arched windows. An unique feature to the reading room is its ceiling, coffered in American Black Walnut. Between the coffers are four hundred acousto-celotex, perforated, cane fiber, acoustical tiles (Beardsley).  These tiles act as a sound filter. Each one is decorated with an antique red, blue, and gold rosette design. At the end of the reading room sits an eight foot sandstone fireplace. The hearth is adorned with a red , blue, and green geometric pattern. Above the fireplace used to hang a large Savonorola painting. At one time, the reading room used to also contain two Rembrandts, two Rubens, a Bellini, a Romney, a Whistler, a Homer, and two Sir Thomas Lawrence paintings (Herscher). The paintings are no longer hung in there, however. On September 3, 1993, a theft of the Rembrandt painting "St. Bartholomew," worth approximately $1 million, was reported. The painting hung to the right of the fireplace next to the Savonorola (Post-Journal Weekender). It was never recovered. On the ground floor, a fire-proof vault was installed to protect St. Bonaventure's valuable special collections. Included in the collection are rare books, manuscripts, and incunabula, some dating from the 14th century. Unique features to the collection include a leaf from the original Gutenberg Bible, the oldest bible in North America, and the smallest book in the world (Beardsley). St. Bonaventure also owns original manuscripts by Thomas Merton, Tim Bishop, and Robert Lax. In 1963, Friedsam was expanded to double the stack space. An anonymous gift of $25,000 was made for the project, which cost $50,000. A forty by sixty foot area was added to the rear of the existing stacks. Contractors Stohr and Rowe of Portville, NY matched the brick facing with the Florentine style architecture. In 1974, further renovations were made to Friedsam that included improvements to the fireproof vaults on the ground floor and the addition of a new Resource Center to the back left of the original building. The addition and other renovations cost $2.5 million (Beardsley). The 1974 addition to the back of Friedsam. The interior of the Resource Center. 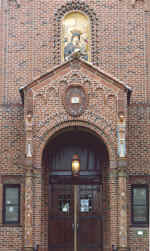 Until the early 1990's, Friedsam Memorial Library was also home to most of the art work given to or purchased by the University. The art collection migrated to the Quick Center for the Arts upon completion of that building. In 2007, construction began on a new Rare Books Wing at the Friedsam Memorial Library. Completed in the summer of 2008, the Holy Name Library for the Franciscan Institute houses approximately 10,000 rare books and manuscripts. Click here to visit the rare book's page! Friedsam Memorial Library testifies to the fact that usefulness does not have to hinder beauty. Visitors to the University are always impressed with its architectural design and wealth of detail. For students, the library is a popular spot to study and, on occasion, socialize. Also, the building's unique design has allowed it to added to and changed through the years without destroying it aesthetic appearance. Friedsam library remains an example that beauty can in fact coincide with function to enhance one's environment. Follow this link to the 75th Anniversary page. Hit counter added 7 July 2010.